CAPI – Face to Face interviewing and Data Collection module. Built with SMP survey editor means you have total control over your survey design. Unlimited surveys, questions, responses, device apps – it’s your system so you are in control. Using SMP’s survey editor then a simple download code and your survey is away. Run the same survey online, embed in a website, send invites or create a kiosk – its all on the same account. Use gates and skips, pipes, embeds, jumps, loops, compute, recodes, timestamps, and reports and take control of your data input. Display video, play music, show images – you have the power. 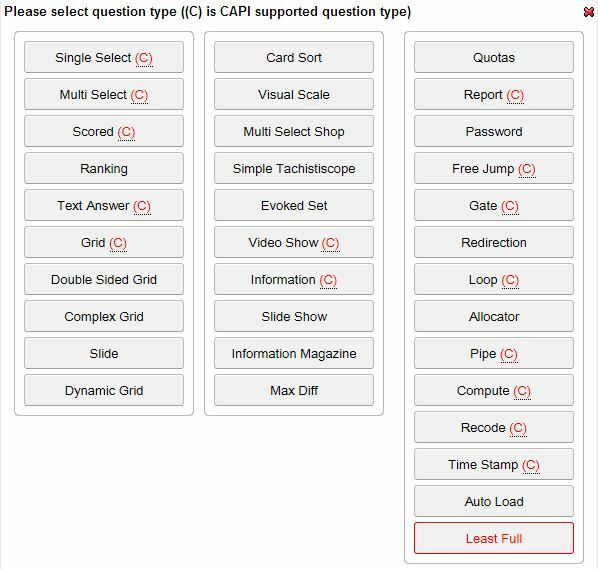 Design your survey using the SMP survey editor, using any of the following question types or controls marked with a red (C). Download your survey to your devices – from anywhere. Loading a survey onto your device is simple. Start the device app – press the download button shown below, type in the download code for the relevant survey and press go. Instantly your interviewers are ready to go. And for the one monthly subscription you can load up as many devices as you need – there is no charge for the CAPI app. Your interviewers complete some interviewing. Your interviewers upload their surveys with the press of a button. Click on a button called Respondents – filter and select the surveys you wish to upload or select “All” – and press Upload. All your interviewers data is uploaded in seconds. Its all a part of your system including the online system so you get it all for the one annual fee. How many tablet devices can I load the SMP CAPI app onto with my Pro account? As many as you like – there are no limits to the number of tablets apps you can download and use. Are there any limits on the number of surveys I can do? No. You can do as many surveys as you like. Are there any limits on the number of responses I can collect? No. You can collect as much data as you like. Can I contribute to its development? Yes – we welcome your ideas. If you have a need that the system cannot currently deliver on please ask. We will endeavour to provide a solution as soon as possible. Much of SMP’s development has come about in response to our customers needs. What tablets can I run the app on? SMP CAPI is currently only available for Android powered tablets and phones such as the Samsung suite of devices.